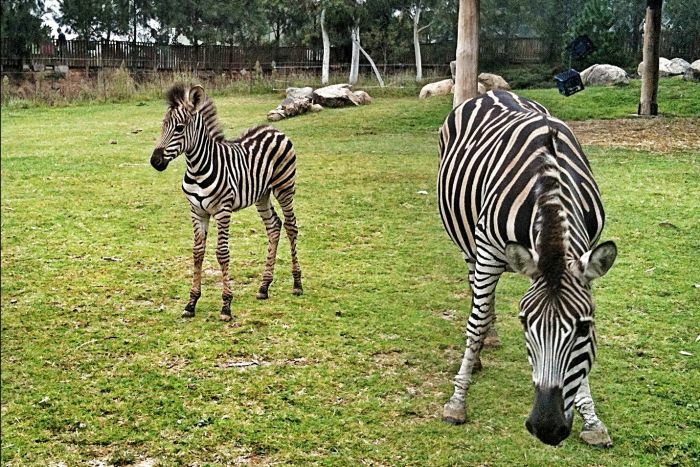 Canberra’s National Zoo and Aquarium has shown off its newest arrival – a baby zebra. Malawi was born just under three weeks ago and wildlife supervisor Bec Scott says he is still reliant on his mother Zahara. She says Malawi is explorative, often wandering off on his own. “He is an excitable fella, he is quite curious and surprisingly they do wander a far bit away from their parents. They do feel quite comfortable in this environment as there aren’t any predators,” she said. Malawi is part of an international breeding program for the endangered sub-species of plain zebras. A number of zoos across the Australasian region are breeding the animals in an bid to raise numbers. “We actually have quite a successful breeding program here at the zoo,” Ms Scott said.